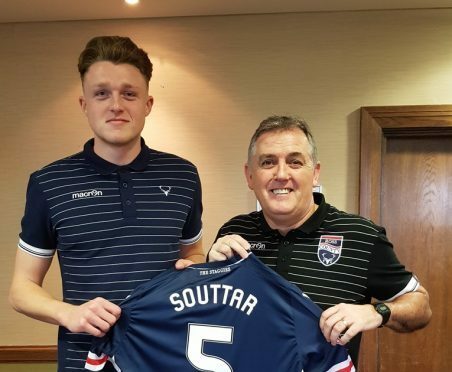 Harry Souttar was signed for Ross County by the now-departed Owen Coyle. Harry Souttar has not had to look far for inspiration since moving to Stoke City and he hopes to return there a more accomplished player after his loan spell with Ross County. Since leaving Dundee United in a £200,000 deal in September 2016, the defender has made just one outing for Stoke – an EFL Cup victory against Rochdale. The 19-year-old found himself in the company of some of the English Premier League’s most seasoned players on a daily basis when he reported for work at the Potters’ Clayton Wood training ground and he signed a four-and-a-half year deal with Paul Lambert’s side. But Souttar felt the opportunity to gain first-team experience with the Staggies was too good to turn down. “It is a great experience to play with such players, and learn what they do after training, what they do in the gym, what they’re eating and what they do in their spare time. I’m getting advice all the time from guys like Charlie Adam and Darren Fletcher. Darren has been brilliant with me since he came in. Souttar had an eventful introduction to his Staggies career in Wednesday’s Premiership match against Motherwell, replacing injured skipper Andrew Davies after just six minutes and then scoring an own goal in a 2-0 defeat, which keeps County three points adrift at the foot of the table. The Aberdeen-born player is determined not to dwell on the moment and is keen to pick himself up for Sunday’s home match against Rangers. He added: “It’s obviously not nice. I just tried to head it out for a corner and misjudged it I just have to forget about it. I wanted to make an impact but that obviously wasn’t the impact I wanted to make. But it is all about how you react to it and I thought I was OK.